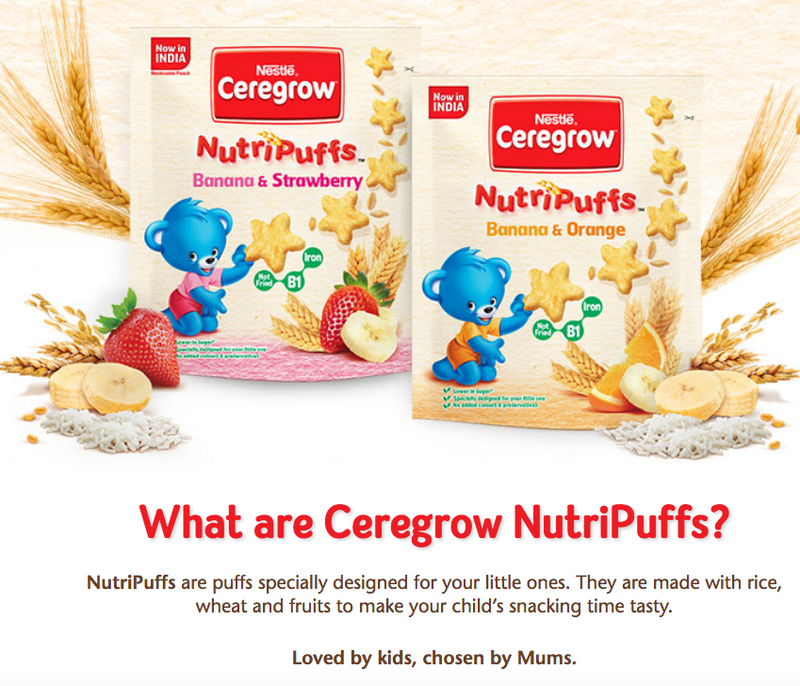 Exactly a year back, I wrote a post on Nestle Ceregrow, a cereal targeted for 2-5 year old kids. If you haven’t read that post, please take a couple of minutes to go through it first. I had expressed my concerns on why we even need such products in the first place. And now there is one more product that has arrived with “Now in India” launch. It is Ceregrow NutriPuffs, that is marketed as a “healthy” snack for 2-5 year olds. All my rants and frustrations from the previous post are applicable here as well, so let’s dive quickly into the facts. 1. Second ingredient - none other than Maida, around 23% being used. Though the packaging shows a beautiful picture of wheat kernels, there is hardly any goodness of wheat in here. 3. Sugar is present in so many forms - highlighted in red. 4. The packaging shows beautiful picture of orange and banana but the quantities available are so measly - 0.8% and 2.7% respectively. 5. Other additives in the form of acidity regulator and emulsifier are present. Starch is nothing but corn flour. 6. The product does contain trans fat. 7. 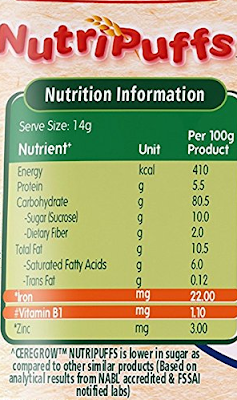 The pack size is 50 gm but the nutrition table is calculated based on 100 gm. 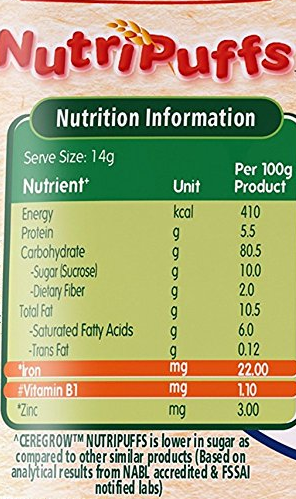 So it is misleading and creating the wrong impression that it is high in iron and Vitamin B1. 8. The 100 gm pack contains a measly 2 gm of dietary fibre. Serving size is 14 gm, so one serving hardly contains any fibre. Maida products tend to cause constipation in kids (adults too). With hardly any fibre, regular consumption of such snacks would end up in constipation and kids would be prescribed laxatives to stimulate bowel movements. Why not give a banana as an evening snack? 1 elaichi or yelakki banana has 2 gm of dietary fibre, along with good carbs, potassium and many other nutrients. In Tamil, there is a phrase “paditha muttalgal” (Educated fools). Yes, that’s what we have become. Sorry if that was rude. But we are voluntarily enrolling ourselves into that category by choosing such foods for our innocent kids. My daughter’s best friend is 4.5 years old. A year back, she would only eat bananas (and mangoes when in season) and no other fruits. But her mom never gave up. Every evening, she feeds her either apple, grapes or orange. She carries a snack box to the play area and diligently feeds her while the two kids play together. It is so heartwarming to see a mother going that extra mile to feed fruits to her child and not take shortcuts with such “cleverly marketed” junk foods. We need more such moms who can invest that required time and effort. Yes, it takes a lot of effort to feed healthy foods to our kids every single day. There is no easy way out. And it is even more important, given the amount of trash that is flooding the supermarket shelves in India these days.